Dwarf rabbits and any animal in general have to ability to express their feelings and needs, not as humans do, but they do “speak” an animal language, and as an owner and rabbit lover you have to learn to understand your little furry friend. Hitting the floor with the posterior legs. This means little rabbit is scared, so when you hear the noise made by his back legs go and make it know there is nothing to be afraid of. Peeing around. Non-castrated adult female and male dwarf rabbits will demark their territories leaving on their way an annoying leaking for you to clean up. Males might also pee over the females to address possession. Scattering feces. The dwarf rabbit is such a territorial little creature, and one way to demark its territory is by scattering its poops. This particularly happens when it is in new places. It becomes a custom when another dwarf rabbit is in the same place. Rubbing with the chin. Their chins have smell glands; therefore they rub all their belongings with their chins. False pregnancy. 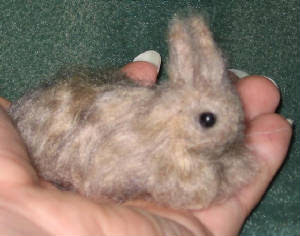 Some female dwarf rabbits that have been sterilized build nests with straw and hairs from their bellies they tear out to clear their teats. They may also stop eating as female rabbits do before they give birth. Let’s continue learning more about the dwarf rabbit code, okie? Our little friends have their own particular way to express their feelings and needs as human beings do, however they do it through their body language and sounds. 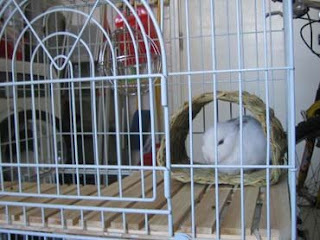 “I feel sick”: Pay attention if your dwarf rabbit turns into apathy, inactive and with less appetite, and its stools are a bit softer than usual. Don’t panic, it is natural it has its bad days, too. But if this continues for over 3 or 4 days, then you should pay a visit to the vet. “I’m mad at you”: You can notice it’s angry by its posture. It will give you a defiant look, putting its ears backwards and throw all the weight of its body on its back legs to jump on you at the minimum approach. It might scratch or bite you. The best way to show it your peaceful intentions is by approaching from the floor, not from above. Never put your hand underneath or in front of its snout: secure attack. Try to lay your hand on its head for caressing. If it allows you to do so, it means he accepts your apologies; otherwise, take your hand out immediately. “I want to get out of here”: Dwarf rabbits just wanna have fun for sure! You can realize when you see your rabbit pet going crazy, standing up on its back legs, biting the cage bars, making noise to call attention or giving you a begging look. Then it is time to come out and play. But even after all that running and jumping, they might want more. In that case, you have to talk to it with a soft voice fun time is over, and wait until it cools down again. “Show me your love”: Dwarf rabbits need caressing and loving, so your pet will approach to you getting between your fingers or poking you with its snout. Do pay attention to this, because it might take it as an offence and answer back with a grunt or biting. In case you have no time or not so much in the mood, just a pair of strokes on its head will make it feel you get its feeling. Anytime you can, give yourself the time for pampering your furry friend. Caress its head, forehead, behind the ears and the back, but don’t touch the back legs: they hate it. Our adorable the dwarf rabbit are not just cutie an cuddling little things to take care of, but with complex animal character that communicate through sounds, gestures and actions rich in significance, that you as an owner have to know in order to establish a closer and better relationship with your furry little friend. Smelling and sniffing out. This indicates curiosity before something new as a place, object or person. 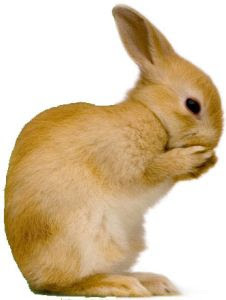 It could be your dwarf rabbit has perceived a strange smell. The faster the nose movement, the higher is its level of interest and curiosity. If your rabbit barely moves it, that means it is in a relaxed mood. Happy climbing! Rabbits love seeing things from above due to their curiosity, so no wonder they try to climb sofas, tables or any high furniture piece. Grunting. This is a clear sign of anger, so you better leave it alone if you don’t’ want to get any scratch or bite. Don’t touch my stuff! Sometimes your little friend will not be very pleased of you cleaning up its cage. It might even bite or scratch. Dwarf rabbits are creatures of habit, and they just like to mess everything up and they prefer things stay that way. That is why it is better you dot he cage cleaning when your rabbit is out of it. They do not smell bad; they do not even need a bath. But they do need to be groomed. They are quiet and you do not need to worry about taking the, out for a walk. Though, they do need to do some exercise. You can train them to potty. They are smart and very social. However, beware of not treating your dwarf rabbit as a dog or cat. The latter are used to live among humans or very long time, while rabbits are still very deep inside wild animals. Dwarf rabbits can be clever, social and loving as well as spoiled, stubborn, destructive and vengeful. You will realize they tend to hate being lifted and cuddled up, which can be dangerous if you touch them when they are angry. You might get hut by their nails, and they have a spine fracture. Dwarf rabbits have a very delicate bone structure, for this reason be careful of letting a child handle them. They are not teddy bears! Finally, it is in your hands to shape up the personality of your dwarf rabbit and let it know you are its friend. So be patient, and you will see how lovable and faithful your little pet rabbit will turn out to be.